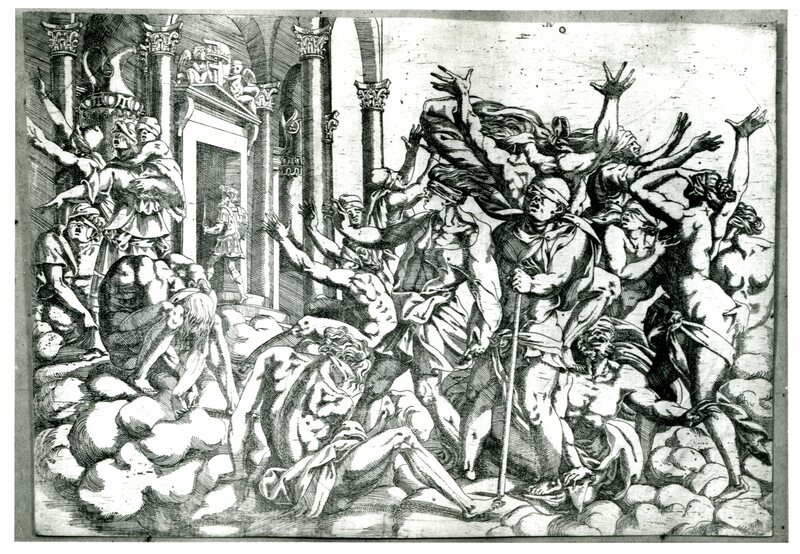 Etching by Antonio Fantuzzi, 26.4 x 53.6 L, 27.3 x 54.4 P (London). Inscribed at the lower left with a monogram composed of joined letters: ATF, and the date 1543 (Herbet and Zerner). Bartsch, XVI, 1818, 350, 30, as Fantuzzi after an artist of the School of Primaticcio. Herbet, II, 1896, 268 (1969, 64), 1, and V, 1902, 80 (1969, 232), as Fantuzzi after one of Rosso’s frames in the Gallery of Francis I, the large letters FRF above signifying: Franciscus Rex Franciae. Zerner, 1969, A.F.33 (Paris, Eb 14d). COLLECTIONS: Amsterdam (De Jong and de Groot, 1988, 268, 598). Berlin, 141-22. London, 1850-5-27-36 IMP. SIZE. New York, 49.95.183 (cut at top, damaged along left edge); 66.658.5 (slight tear at left and right, and upper left corner missing). Paris, Ba 12; Eb 14d; Ed 8b Rés., boîte, no. 137. Paris, Arsenal, Vol. 168(1), no. 14, dark brown ink, slightly cut at right. Vienna, Vol. XIII, 2, p.69, no. 429. Schéfer, 1894-1929, col. 552, no. 14. Berliner, 1925-1926, I, Pl. 110, Text volume, 40. Zerner, 1964, 75, 77, Fig. Hackford, in Ornament, 1972, 52-53, no. 43, Pl. XL. Zerner, in EdF, 1972, 267, no. 313, and in Fontainebleau, 1973, I, 99, Fig. 73, II, 82, no. 313 (Paris). Zerner, 1972, 114, Fig. 169. Béguin and Pressouyre, 1972, 140. Zerner, IB, 33, 1979, 250 (London). Wagner, 1979, 141-142, 265, Fig. 1. Byrne, 1981, 122, Fig. 159 (New York, 49.95.183), 123, no. 159. K. Wilson-Chevalier, in Fontainebleau, 1985, 134-136, no. 81 (Paris, Ba 12). E. Hevers, in Zauber der Medusa, 1987, 348, no. VII, 13, Fig. (Paris). Carroll, 1987, 255, 256, n. 12, under no. 79. Carroll, 1989, 27-28, Fig. 47 (wrongly as 48; Paris, Ed 8b Rés., no. 137). Reed and Wallace, 1989, 28-29, no. 15, Fig. (New York, 66.658.5). Boorsch, in French Renaissance, 1994, 239-241, no. 40, 240, Fig. (Paris, Ed 8b), 152, Fig. 45 (detail), representing a conception of the ensemble for the gallery at a point close to but not yet the final resolution; the Flemish style landscape here and in related prints conceivably by Fantuzzi, or by Master I.♀.V., whose prints have the same kind of landscapes, and then borrowed by Fantuzzi, but this does not seem particularly plausible; likely by someone specializing in landscapes who was either Flemish or strongly influenced by Flemish landscapes; Thiry was Flemish but too little is known of him, and his landscapes etched by Léon Davent are very different. 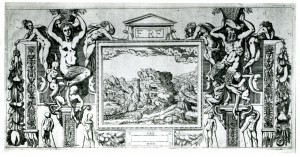 This etching is related, in reverse, to the framing of the Enlightenment of Francis I in the Gallery of Francis I (Fig.P.22, VII S a), with the central fresco replaced by a landscape. The major differences between the etching and the frame in the gallery are specified in the catalogue entry of the latter (P.22, VII S). 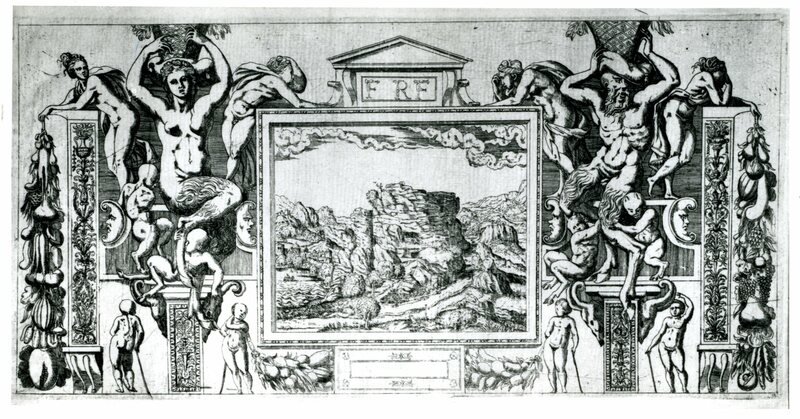 As stated there, it is likely that Fantuzzi did his print from a lost drawing by Rosso of an early conception of this frame. Certain changes would seem to have been made by the etcher, including the decoration of the pilaster strips and the baskets on the satyrs’ heads. But in general, except for the landscape, one should probably see the etching as representing a conception by Rosso, as is the case with Fantuzzi’s other prints related to Rosso’s inventions. The letters FRF for Franciscus Rex Franciae could have been intended by Rosso in this location before it was decided that salamanders would appear above every large fresco in the gallery. This print by Fantuzzi is the only one by him of a frame in the gallery the central image of which was also etched by him (Fig.E.74). COPY, PRINT: E.57,8. Du Cerceau, etching. Herbet, IV, 1900, 306 (1969, 156), VI (Petits Cartouches), 22. Derived from Fantuzzi’s etching, reversed and with variations.